My gorgeous Falabella bag hasn’t left my arm since it arrived almost 2 weeks ago. And yesterday I finally got around to snapping a few outfit pictures with it. Since the bag has the python pattern I usually try to stay away from other patterns when wearing it – but it definitely works well with all basic colors and even some subtle patterns (ie. like my pants in the pictures below). 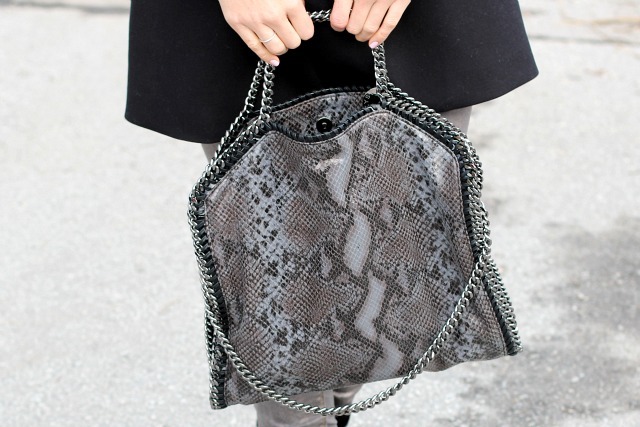 In the beginning I thought I would only be able to use the bag for certain occasions, due to the python – but it seems to work with much more than I ever thought ♥ So happy about this baby being part of my wardrobe from now on! Wow, du siehst toll aus! Deine Augen strahlen richtig schön! Sieht wunderschoen aus! Ich mag Schlangenmuster einfach gar nicht, aber ganz in schwarz würde mir die Tasche auch total gut gefallen. Solange sie dich glücklich macht, reicht das aber schließlich auch! The print from your pants is hardly noticeable in the pictures, but the outfit look great nonetheless! I specially like the scarf, not only is its color the most gorgeous light shade, but it looks so comfy and cuddly!! Ich liebe das Outfit ! Und die Tasche ist ja wohl mal zum niederknien ! Vicky you are so beautiful ;-), love this pics! die farben stehen dir wahnsinnig gut, und deine augen – einfach nur WOW!!!!! sehr schön dass du solche freude damit hast, so zahlt sich dein sale kauf wirklich aus 🙂 das outfit ist wirklich hübsch das bisschen schnee macht auch ne nette stimmung! I’m absolutely in love with the bag, and I really like your blog too! It has such a friendly design! I encourage you to visit my blog based in Madrid, Spain as I am sure you could like it! I love that it matches your pants in this outfit. The bag is gorgeous! I remember seeing the black version when it first came out…le sigh. Also ich finds echt sympathisch, dass du eine der wenigen Bloggerinnen bist die sich mit Echtpelz zurückhalten. In letzter Zeit entwickelt sich da ja ein Trend dazu. Ich liebe dieses Outfit!! Besonders die Hose hat es mir total angetan! Meinst du, die kann man noch irgendwo finden? Das Gesamtbild mit der tollen Tasche ist einfach grandios! Beautiful pictures and beautiful bag! Love your style! Viele liebe Grüße! ich mag die tasche in komplett schwarz lieber..das muster ist nicht so meins. aber den schal finde ich ganz wundervoll! I really love the bag! Great buy!! !